I’ve been internalising some of the Leadership principles that Amazon expect to see in every employee, as documented here. All of these explain a lot about Amazon’s worldview, but even the very first one is quite a unique in the IT industry. It probably serves a lesson that most other IT vendors should be more fixated on than I usually experience. In times when I looked after two Enterprise Systems vendors, it was a never ending source of amusement that no marketing plan would be considered complete without at least one quarterly “competitive attack” campaign. Typically, HP, IBM and Sun (as was, Oracle these days) would expect to fund at least one campaign that aimed squarely into the base of customers of the other vendors (and the reseller channels that served them), typically pushing superior speeds and feeds. Usually selling their own proprietary, margin rich servers and storage to their own base, while tossing low margin x86 servers running Linux to try and unseat proprietary products of the other vendors. I don’t recall a single one working, nor one customer that switched as a result of these efforts. One thing that DEC used to do well was, when a member of staff from a competitor moved to a job inside the company, to make it a capital offence for anyone to try and seek inside knowledge from that person. The corporate edict was to rely on publicly available data only, and typically to sell on your own strengths. The final piece being to ensure you satisfied your existing customers before ever trying to chase new ones. Microsoft running “Scroogled” campaigns are a symptom (while Steve Ballmer was in charge) of losing their focus. I met Bill Gates in 1983, and he was a walking encyclopedia of what worked well – and not so well – in competitive PC software products of the day. He could keep going for 20 minutes describing the decision making process of going for a two-button mouse for Windows, and the various traps other vendors had with one or three button equivalents. At the time, it followed through into Microsoft’s internal sales briefing material – sold on their own strengths, and acknowledging competitors with a very balanced commentary. In time, things loosened up and tripping up competitors became a part of their playbook, something I felt a degree of sadness to see develop. Amazon are much more specific. Start with the customer and work back from there. Unfortunately, I still see server vendor announcements piling into technologies like “OpenStack” and “Software Defined Networking” where the word “differentiation” features heavily in the announcement text. 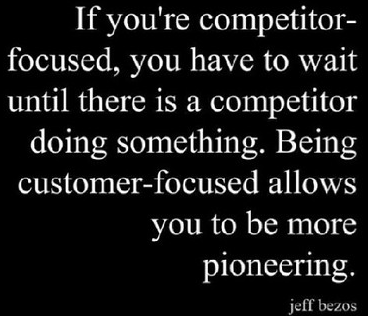 This suggests to me that the focus is on competitive vendor positioning, trying to justify the margins required to sustain their current business model, and detached from a specific focus of how a customer needs (and their business environment) are likely to evolve into the future. With that, I suspect organisations with a laser like focus on the end customer, and who realise which parts of the stack are commoditising (and to follow that to it’s ultimate conclusion), are much more likely to be present when the cost to serve steps off the clifftop and heads down. The real battle is on higher order entities running on the commodity base. I saw an announcement from Arrow ECS in Computer Reseller News this week that suggested a downturn in their Datacentre Server and Storage Product orders in the previous quarter. I wonder if this is the first sign of the switching into gear of the inevitable downward pricing trend across the IT industry, and especially for its current brand systems and storage vendors. IT Hardware Vendors clinging onto “Public” and “Hybrid” cloud strategies are, I suspect, the final attempt to hold onto their existing business models and margins while the world migrates to commodity, public equivalents (see my previous post about “Enterprise IT and the Hall of Marbles“). I also suspect that given their relentless focus on end customer needs, and working back from there, that Amazon Web Services will still be the market leaders as that new landscape unfolds. Certainly shows little sign of slowing down.